Santa Fe is a mecca for shoppers. Whether you are decorating your home in Southwest decor or are looking for that special piece of Indian jewelry, Santa Fe will have what you are looking for. We provide you with suggestions for a great Santa Fe shopping experience. Some of our selections are internationally known and others are will totally surprise you. Let's get ready to shop 'til we drop in Santa Fe, New Mexico. If you want to go to a place that has hand-selected the best jewelry from the best Native American artisans try Ortega's on the Plaza. Located right on the corner of W. San Francisco and Lincoln, Ortega's is a good place to go if you want to ensure that your purchase is authentic and that you have the choice of the most noteworthy and creative artisans. You'll find amazing jewelry, masks, pottery and rugs. Of course, you will pay dearly for all this hand-selection of pieces, but if money is not an issue, we recommend heading for Ortega's. Rainbow Man, on 107 E. Palace, has a unique collection of Edward S. Curtis photography. These historic prints are worth a stop. The shop has long been a trusted source for Native American and Hispanic art and gifts. If you want to see beautifully displayed high-end Pueblo pottery, head for the Fisher Gallery just off the Plaza at 100 San Francisco. Andrea Fisher's has fantastic examples of well-known potter's art and the staff is extremely knowledgeable. If Ortega's is a bit too pricey for your taste, head for the vendors under the shady portal at the Palace of the Governors on W. Palace Avenue, also on the Plaza. The vendors are screened, their jewelry and crafts are made by the artisans and the prices are considered average. The 900+ vendors represent forty-one tribes, pueblos, chapters and villages in New Mexico, the Navajo Nation, and parts of Arizona. The first thing to know about art in Santa Fe is that Canyon Road and the Plaza area are the most frequented. You'll keep busy enjoying a wide variety of art in both areas of Santa Fe. If you want something bright and creative, head for the Ford Smith Gallery at 135 W Palace Ave # 101. Aside from the massive oils, there are reasonably priced Giclee' prints. The artist and his wife are often on-site and their openings draw an interesting crowd. Just off Canyon Road is Delgado Street, home to some very interesting galleries tucked away in vintage adobes. Of particular note is the Galerie Esteban. If you enjoy modern/classic Spanish guitar, Esteban is probably known to you. You can purchase his CDs and DVDs at the gallery and peruse a great selection of local art. If you are enthralled with the little adobe gallery, look out back at the patio and garden. You can actually arrange to have your wedding there! Out Cerrillos Road look for the big Jackalope store. You can find imports from Mexico like brightly painted Oaxacan animals, inexpensive woven rugs, glassware, pottery for your yard and much more. You won't find the rumored Jackalope, however. Each year the Santa Fe Indian Market includes 1,200 artists from about 100 tribes who show their work in over 600 booths. The event attracts an estimated 100,000 visitors to Santa Fe from all over the world. Buyers, collectors and gallery owners come to Indian Market to take advantage of the opportunity to buy directly from the artists. For many visitors, this is a rare opportunity to meet the artists and learn about contemporary Indian arts and cultures. Quality is the hallmark of the Santa Fe Indian Market. You will find jewelry, pottery, art and furniture. Held annually in August. Santa Fe's Spanish Market, held annually in July, celebrates the colorful Hispanic culture of Northern New Mexico. 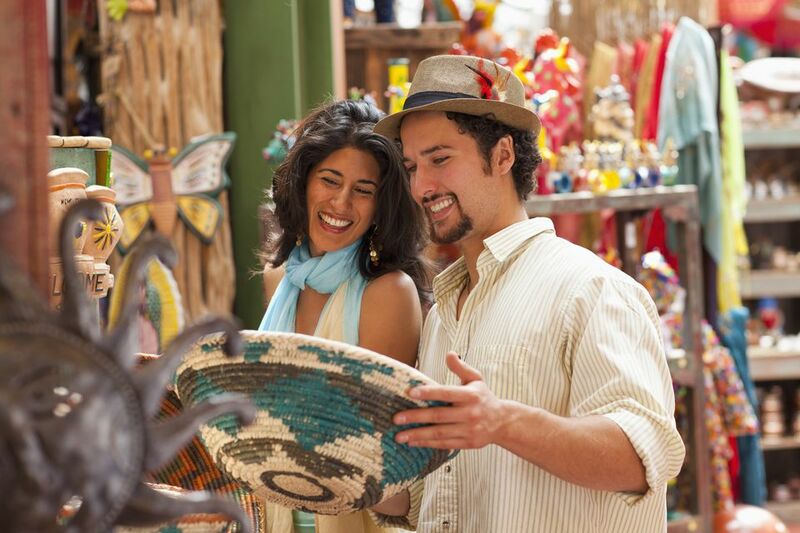 The traditional Spanish Market features handcrafted arts by 250 local Hispanic artists, music and regional foods. The same weekend, you can also visit the contemporary Spanish Market. It's a great place to buy tinwork, religious folk art and carvings.